Recently I read with interest an AP article regarding the National Women’s Wine Competition with the slogan “Wine Women Want”. (The Signal March 10, 2007) I can’t go. You can’t go. We weren’t even invited! But we can crash the event in my next column. Here’s how: In three sentences or less please tell readers what your “relationship” is with wine. Whether you resent not being able to drink as much, thereby not enjoy as much, as the men you don’t outweigh or are sullen when a waitress announces the price to make sure you really want to order that $21 wine by the glass that no male date appears with you to pay for…let me know. Maybe we women do have more in common on the subject of wine than we realize! Maybe women don’t want a wine whose label announces “Menopausal Merlot”? It’s up to us to identify and demand what we want from the market before men make the decision for us! “My name is “Claire.” I love wine. My relationship with wine is sacramentally sanguine: holy and hopeful. Christ’s first miracle was changing water into wine at a wedding. Later He held a cup of wine and said, “Take this, all of you, and drink from it.” What better endorsement do I need? “I am interested, but I just don’t know the name of the wine that I liked because I just had it at a restaurant the other night…besides that now I am a full fledged whiskey drinker. On an Internet search, typing in just women and wine, the first site that I found was www.wine-women.com. It was hosted by Galia Daleva Galmes, her husband Pierre Galmes a “chauffer in the wine regions of France”, events that she will attend, a long list of countries that give only the winery’s female employees, teachers, writers and photographers and finally a link to www.winewomenawards.com all unfortunately in French. It was more women on wine than even I was prepared for. But I still searched for more. 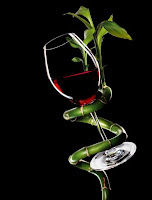 In a Danish test, (www.ajcn.org), fifty-four percent of women over 30% of the men preferred wine. You can read much more about the growing trend of women over men as wine drinkers at www.wineinstitute.org. It’s much too late to e-mail all my male friends to see if they agree with any of this reported data. (And that might irrevocably change the column’s bias.) But from my research I bet I am not the only female vinophile wondering about this! The rest of you have undoubtedly already corked your own bottle waiting for hubby to make it home for dinner, the book club to start or the sitter to show. And if “Johnny” is right then it is definitely time to bring on the PMS Pinot before church! Are you with me? This research shows that you are!